I recently wrote an article for Jo Ann’s Art Advice blog about the importance of networking with other creatives to diversify your business and I’ll be touching on the topic during Justin and my webinar for RISD next week. You can’t go it alone. 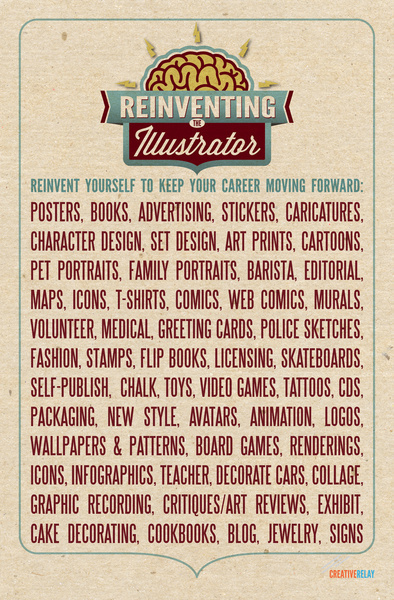 Being a freelance illustrator is challenging and competitive. The worthy competition challenges you to find ways to get out in front of your peers and prove your value to potential clients. How can you do this? Naturally it starts with solving a client’s visual problem which may require additional skills that you may not have. Knowing how and what to deliver to get any job done right takes experience, professionalism and research. It often also requires ‘diversification’. How many times has a current or potential client asked you if you can design a poster, packaging, business cards or a header for a website? How many times have you been asked if you have the skills to animate? Businesses large and small expect creatives to do more and more to solve their challenges without forcing them to hop around to multiple studios. When you turn down these jobs or refer them to someone else you’re not only losing out on opportunities but you could be turning away future business as well. It’s time to put your entrepreneurial hat on. Yes, it can be a beret.